Rex Tillerson talks about his strained time being Trump’s Sec of State. 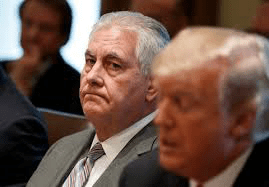 Rex Tillerson talks about his strained time being Trump’s Sec of State…. It wasn’t pleasant as we have seen in past media snippets …. And Tillerson also level criticism against those who would follow Trump’s not wanting or caring about how things actually work in the real world…. Tillerson’s views and concerns point to the reason Robert Mueller & Co. are uncovering layers of illegality in Trump’s private and official actions among friends, family and associates …. When asked about his federal service, Tillerson told the crowd Thursday that he had never actually met Trump until he was invited to the White House by Vice President Mike Pence for a meeting that ended with him being asked to become secretary of state. The honeymoon didn’t last long, Tillerson said. The relationship between him and Trump became strained after the president grew tired of the former Exxon Mobil CEO telling him that he could not do things the way he wanted. Tillerson said the two had starkly different styles and did not share a common value system. “So often, the president would say here’s what I want to do and here’s how I want to do it and I would have to say to him, Mr. President I understand what you want to do but you can’t do it that way. It violates the law,” Tillerson said. Trump would get very frustrated when they would have those conversations, he said. Tillerson said Trump rose to power by tapping into something that the American people felt very strong about and using the tools of the day such as Twitter to do it. “I will be honest with you, it troubles me that the American people seem to want to know so little about issues, that they are satisfied with a 128 characters,” Tillerson told Schieffer. Tillerson voiced those concerns even further in his conversation. “I don’t want that to come across as a criticism of him,” Tillerson said. “It’s really a concern that I have about us as Americans and us as a society and us as citizens”…..